The Telecommunications Industry is constantly changing with new platforms being designed and tested before the previous iteration has gone to market. The industry demands smaller, faster components with increased storage capacity. 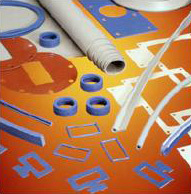 This creates a new set of sealing challenges for EMI/RFI Shielding, thermal management and environmental gasket applications. Niantic Seal’s technical sales engineers will meet with you to determine the best integrated solution to meet your particular needs through our broad selection of Performance materials from leading manufacturers. We strive for excellence with on-time delivery, inventory depth, packaging compliance and consistent quality conformance. Niantic Seal always welcomes the challenge of finding solutions for specialized requirements that fabricating distributors shy away from. We invite you to take full advantage of our design, engineering and fabrication expertise to complement your products.